While traveling in America, I went to stay with distant family friends, and it turned out to be a beautiful experience. I also stayed with strangers, friends and friends of friends along the way. I was always so astounded and touched by how good people are even when they don’t know you from Adam (I love idioms). One of my hosts decided to write out a prayer for me one evening that I still carry around with me to this day. The next day after receiving the prayer, I was cycling around Los Angeles exploring aimlessly on my own, one of my greatest loves. I stumbled upon Rose cafe and was transfixed by a huge rose structure engulfing the doorway. Drawn by some kind of force, I jumped off my bike and entered the cafe. 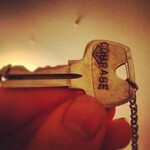 Perusing the array of knickknacks, cakes and chai lattes for sale, I found a giving key necklace with the word courage printed on it. I wasn’t one for making too many purchases while travelling, they only slow me down. The weight and cost was too much for this young brit. Yet this key…I felt it was exactly what I needed and the world had provided it for me. Travelling alone and trying to figure myself out, I wore this key around my neck the whole journey. Things went pretty darn well. I’m not suggesting the key had anything to do with it. Things always seem to turn out the right way in the end. After receiving that prayer and so many wonderful people into my life, I felt as though I needed a reminder of what I’d learnt while I was away. I’ve never been one for wearing jewellery all that much, as I constantly lose things. One of my friends will only ever buy me jewellery if it won’t matter if I lose it. Its not that I don’t care about things, its just that I rarely let them become a part of me. But that necklace somehow did. It reminded me not to be scared of the unknown. Contrary to my earlier post about non-attachment, I was definitely attached to this giving key. The idea around a giving key is to pay it forward; you help employ homeless people by buying it, you have it for a while, and when you feel the time is right, you give the key to someone else who needs it more. Then the receiver of the key becomes the new giver. It builds this beautiful chain of people giving a gift of courage and paying the ideal forward. I loved the narrative of it all, but didn’t want to give it away. I was attached! Someone, who knows me too well, pointed out I was attaching my achievements and new state of mind to this object, which obviously was not part in parcel of my behaviour. I quickly found someone who I wanted to pay it forward to, a friend who was about to embark on her own travels. My travels weren’t finished, neither was my development, but giving it to her was a great gift for me, as I realised I still was this courageous me without it. Also, the knowledge that the new and wonderful things this key brought me, which was now going to be a part of her, made my head whirl. The narrative continues with a new lead girl! Is there anything you’ve found yourself attached to for all the right and wrong reasons? Thanks a lot Dana I’m glad you enjoyed it!